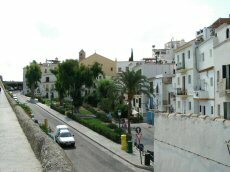 Eivissa is situated at the south of the island, this is the administrative center of the island. The historic center is classified by the Unesco. 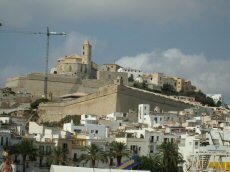 Eivissa is one of the most picturesque city of the mediterranean area. The old city surrounded with wall is the host of the magnificent cathedral and the Santo Domingo church. 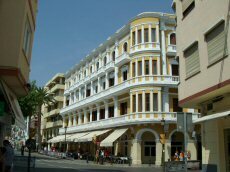 The harbor is situated at the bottom of the old city, it is the departure point of boat services to Formentera, Palma, Denia and Barcelona. Many restaurants and bars are situated near the piers. The surrounding wall of the city is classified ancient memorial since 1942. This wall was built between 1554 and 1585 under Charles Quint orders. This is an heptagonal structure with three doors to get in. The main entry to the city is Las Tablas Gate, with a drawbridge built in 1585 under Philippe II. The other intersting gate is Portal Nou were you can see Puig de Mouns, wich is the most important necropolis discovered today. Built during the XIII and XIV centuries, it is situated on the place of a former temple dedicated to Mercury.